Due to a crush of visitors and unrest in the West Bank, the Church of the Nativity is on UNESCO’s list of World Heritage Sites in Danger. Photo Credit: Benjamin S. Mack/GALO Magazine. If nothing else, the Palestinian territories spark controversy when discussed in any setting. Such a conversation can, of course, occur anywhere, but in Jerusalem’s cafes, bars, streets and homes, it is especially divisive. Ask anyone and they can tell you how they’ve been impacted by the “separation barriers” that exist between the West Bank and Israel proper, a system of walls and fences meant to keep Israelis out — and Palestinians in — not unlike the infamous Berlin Wall. Some might discuss how their family has been torn apart, others how business has suffered, and others still how ugly the wall looks amidst an otherwise rustic skyline. Personal testimony aside, one thing all parties can agree on is that the wall has created a separate Israeli and Palestinian identity. It was partially that separate identity that led my friend Ally and me to the West Bank on day three of our visit to the Holy Land. Having already seen Jerusalem and some of the surrounding environs (the Dead Sea, Jordan Rift Valley, and the Sea of Galilee), it was time to delve into what makes the area tick. Any trip to Palestine requires an understanding, even on a simplistic level, of the complicated history of the area. In 1946, Transjordan (later to become Jordan and part of Saudi Arabia) gained independence from the British-controlled territory of Palestine. A year later, the United Nations adopted a partition plan for a two-state solution in the remaining territory. On the eve of British withdrawal from the region, the Jewish Agency for Israel declared the establishment of the State of Israel. The Arab Higher Committee did not declare its own state and, instead, together with other members of the Arab League of the time, commenced military action resulting in the 1948 Arab–Israeli War. During the war, Israel gained additional territories, while Egypt occupied the modern-day Gaza Strip and Transjordan occupied the West Bank. During the Six Day War in 1967, Israel gained control of the West Bank and Gaza Strip. Subsequent accords and treaties have given the Palestinians some autonomy since then, but the territories remain under Israeli occupation. That was the backdrop to our foray into the West Bank, anyway. But Ally, a former White House intern, and I both knew that, if we were going to truly understand and truly experience the Holy Land, we would need to visit a Palestinian-controlled area. We could peer into the West Bank from the windows of our apartment atop a hill we were staying at in the Jerusalem suburb of Gilo, but simply seeing the soaring minarets of mosques and various whitewashed buildings was not enough. We had to be there. And being there, of course, meant navigating what we assumed would be one of the most secure borders on earth. As anyone who skims the news headlines also knows, fighting between the Israelis and Palestinians is frequent. Israeli military operations in the West Bank and Gaza are commonly met with Palestinian groups, such as the Hamas, firing rockets into Israeli territory, and assassinations, hostage-taking and bombings are perpetrated by both sides. Translation: the two get along about as well as the North and South Koreans. It was amidst this backdrop of unease and mistrust that we found ourselves in Bethlehem, one of the West Bank’s largest cities. A once-thriving tourist spot known as the Biblical birthplace of Jesus Christ, the number of visitors to the town of roughly 25,000 has declined in recent years. 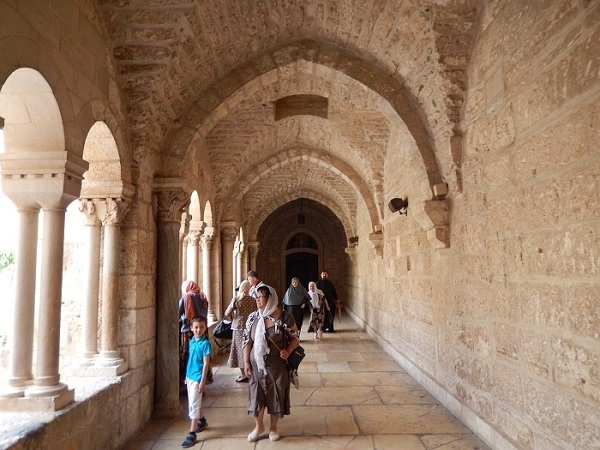 The majority of remaining visitors are pilgrims who travel to the Church of the Nativity; the church was originally commissioned in 327 AD by the Roman Emperor Constantine and had been built over the site that is believed to be the exact birthplace of Christ. Recent incidents at the church itself have been a major cause for the decline. In April 2002, during the Second Intifada, about 50 armed Palestinians locked themselves in the church, taking some 200 monks and others hostage. Because of the sensitivity of the building — named a UNESCO World Heritage Site in 2012 — the Israeli military did not break into the church, instead initiating a blockade. The siege lasted 39 days, with some of the gunmen shot dead by military snipers. After lengthy negotiations, it was agreed that the gunmen would be evacuated to Gaza, Spain and Italy. No major security incidents have occurred at the church since, but the air of uncertainty was palpable as we rode the 21 bus from the Damascus Gate at the entrance to Jerusalem’s old City and into the West Bank. A mere eight Israeli shekels ($2.30, at 3.47 shekels to the dollar) was all it took to secure our passage on a bus filled almost exclusively with Palestinians, as Israeli civilians are generally forbidden from entering the West Bank or Gaza. We’d spent the earlier part of the day at the famed Mahane Yehuda market, a partially-covered souq dating from the late 19th century that attracts nearly 200,000 shoppers weekly, with over 250 vendors selling mostly fresh fruits and vegetables, baked goods, fish, meat, cheeses, nuts, seeds, spices, wines, clothing and housewares. The exotic sights and smells are one reason why Travel + Leisure named Jerusalem the top leisure travel city in Africa and the Middle East in 2010, and it was certainly a pleasant enough way to spend the morning weaving through the hordes of shoppers bent on negotiating the best deals. At one stall there were men arguing over the price of mountains of nuts. At another, there were rows upon rows of various candies in every color and shape conceivable. In another, stacks of fresh fish on ice could be found — even though Jerusalem is over an hour’s drive from the Mediterranean Sea. The pungent odors of coffee and spices collided with jasmine and incense in a dramatic aromatic duel, just like how spoken Hebrew squared off in an aural showdown with the equally commonly spoken Arabic. Each of the five senses was overwhelmed by the market’s simmering energy; a vigor which one could never find back home in Germany.